On a recent trip back to Michigan State University, I had to occasion to wander a bit on campus. I was chaperoning for my daughter’s orchestra students as they participated in a day long workshop, but I did have a few “breakout” opportunities during the day. It had been at least 3 million years since I had graduated from State and the beautiful fall day was too much to resist. The northern portions of the grounds have changed little since my tenure there. Now, if you (as a regular reader) haven’t figured it out by now, I am a hunter-gatherer by nature. I seek nature where I can find it. I gather much of my experience up in my camera and often end up putting some of it in my pocket. Even the relatively cultured environment of a campus offers “h-g” types such as myself some forage chances. This particular trip, although limited to only a few hours duration, was distinguished by variety, if nothing else. Take the well-cultured environs of the Beal Gardens, for instance. There among the rows of browned stems and stake labels marking vacant spaces, the tendrils of a lone trumpet vine hung limply on its support cage. In mid-summer this spot would be glowing with bright orange-red trumpet flowers but in November only long slender seed pods remain. The label reminded me that Trumpet Creepers, as they are known, are actually native to the S.E. United States. 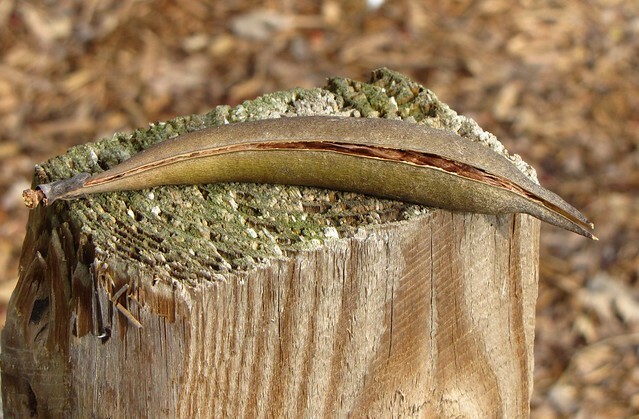 In northern climes, however, they are often treated as troublesome suffocating invaders – thus earning the unlikely names Devil’s Shoelace and Hell Vine. Wow, them’s tough woids, eh? 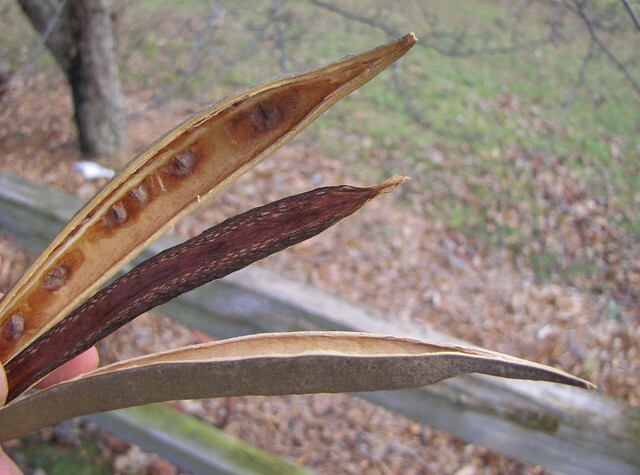 The Trumpet pods are not evil, in and of themselves, but these pointed narrow pods each contain thousands of winged seeds which serve to propagate thousands of potential tools of the devil. On this cool November day, I could appreciate the pod and its structure without judgment. When opened, the trumpet vine’s tongue is exposed for observation (note that it is not bifurcated). It was an interesting pod – n’est ce pas? A large mangled Yew bush provided yet another insight into small things. This Yew was not in the gardens, but instead was adorning the front of one of the distinguished old halls. Apparently the grounds maintenance crew was in the process of trimming the things back after a half a century of rampant growth. 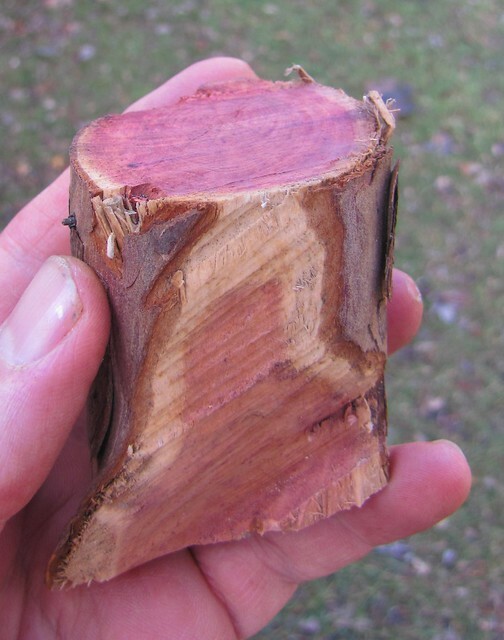 The raw cut stems instantly attracted attention due to their nearly blood red cores (heartwood). I later determined the age of one 2 inch diameter segment to be at least 55 years old. 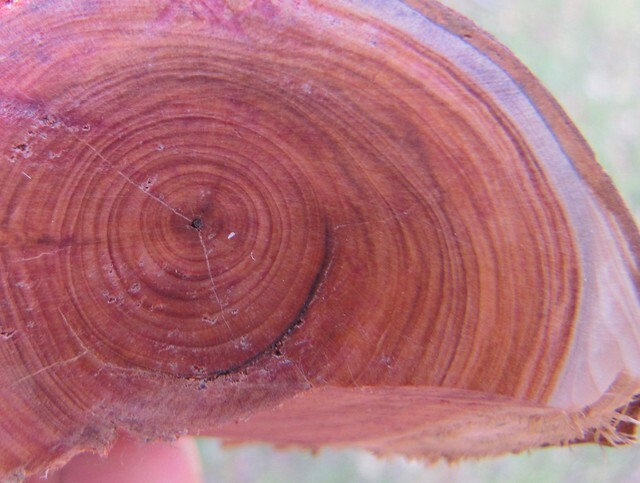 The wood of the Yew shrub was hard and dense and the rings were spaced very close together. It is no wonder that yews are some of the oldest plants on the planet– some individuals attaining 2,000 years of growth. It is a tree that was familiar to the likes of Otzi, the famous iceman, who carried an unfinished bow of yew wood with him into the mountains. I too carried my yew specimen in my pocket but did not end up frozen into an awkward position by the end of the day. Under the newly exposed ground beneath the yew patch, a Squirrel skull revealed itself. 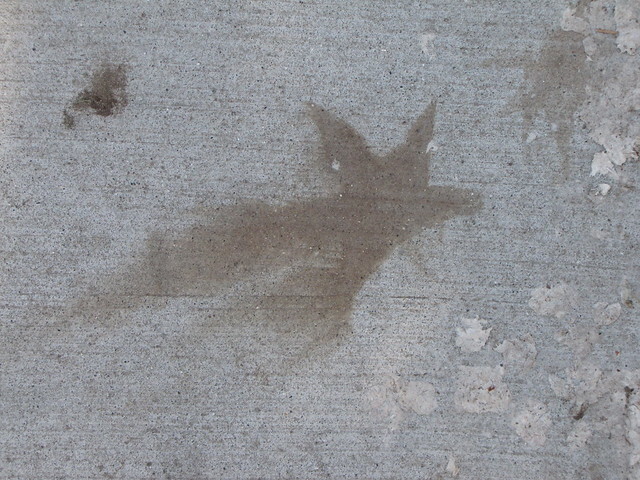 The campus is chock full of both Fox and Gray (Black) Squirrels. At some time in the past, some poor sick nut-cruncher crawled into the safety of the bushes to die. My immediate question in this case was whether the rodent in question was a Gray or a Fox Squirrel. I also pocketed this example for later determination since I could not decide at the time. Later, I measured the piece for an answer. According to my mammology texts, Gray Squirrel skulls are always 2.5 inches or shorter. 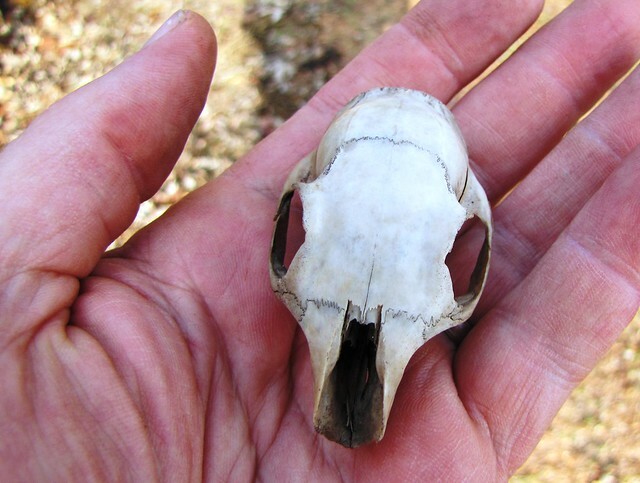 Fox Squirrel skulls are always 2.5 inches or longer. So, you can see the initial lack of identification clarity when my subject turned out to be exactly 2.5 inches long! 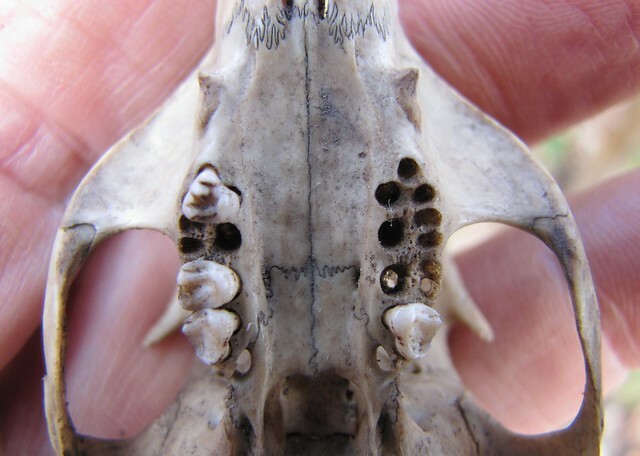 The dentition (tooth) test leaned toward Fox Squirrel (see underside view below) because Gray Squirrels usually have one extra little premolar in front of each row of molars, while Fox Squirrels do not. This skull had no extra premolars. Because 1% of Gray Squirrels do not have this extra set of teeth, there was still a very slim chance my skull was simply a toothless Gray. My last test involved a black light and a darkened room (similar to some of the rooms on my old dorm floor back in the 70’s). Apparently, Fox Squirrel bones glow pink when under black light because they retain a chemical called porphyrin. I’m not sure that ONLY Fox Squirrel bones glow pink, but never-the-less, it sounded like some worthless fun. So, take a look below and see if you can tell if my specimen was glowing pink or it simply looked pink under the pinkish glow of the black light bulb. Either way it was a groovy experiment, man. Speaking of groovy, my final find of the day proved to be the most mind-blowing of all …like, oh wow man. 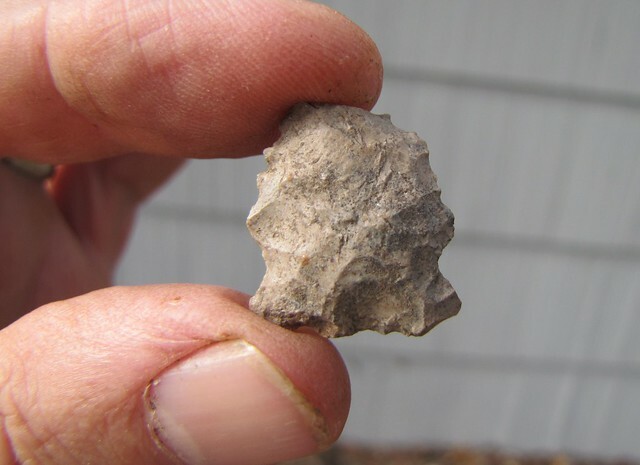 On a well worn dirt trail – the kind that always develops in the grass angle where two sidewalks meet at a sharp angle – I found a projectile point. Yes, on a shortcut that I myself took many times during my illustrious career on campus (mmmmmph years ago), a flint projectile point sat on the dirt exposed by the rain and the constant scuffling of educated feet. Because many of those educated feet were supporting distracted educated heads attached to cell phones, it is my educated guess that hundreds passed over it without notice. It would be tempting to label this find as an arrowhead, but it was not. 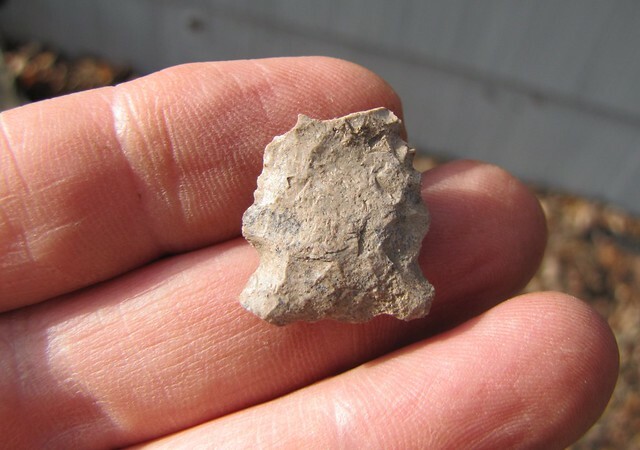 Based on style, the serrated edge and bifurcated base on this little point (the tip was broken off) it dates back to the Archaic period around 8,000 years ago. This style is as distinctive as the identifying lines on a piece of yew wood, the contours on a Hell Vine pod, or the wide forehead look of a squirrel skull. The point long predates my campus occupation. It even pre-dates Otzi and his kind. It harkens back to a time when the Michigan State campus was only four thousand years fresh out of the mantle of glacial ice. My campus ramble only took me an hour or two, yet it took me farther than my feet could possibly carry me (and gave me a chance to use the word bifurcated two times). You’re so very good at this! Your post reminded me of what different worlds we each live in, depending on where our heads are at. You found that little point where so many walked over it so many times, and others have missed so much of what’s around them! We each carry our own reality with us wherever we go, and taste life in layers, based on what our eyes are tuned to see. I do appreciate your wonderful insights into your world, and they encourage me to look a little more deeply into my own world and enjoy it a bit more. Thank you, for opening my eyes a little bit wider. I thought of you this week while teaching my 2 year old grandson to look at the tiny plants in a patch of moss in our woods. We were hunkered down patting it and seeing how soft it was, when he was distracted by a pill bug we scared up. I hope to open his eyes to the world of nature early, you never know where that seeing will take his little feet. Wow – so much cool stuff here! 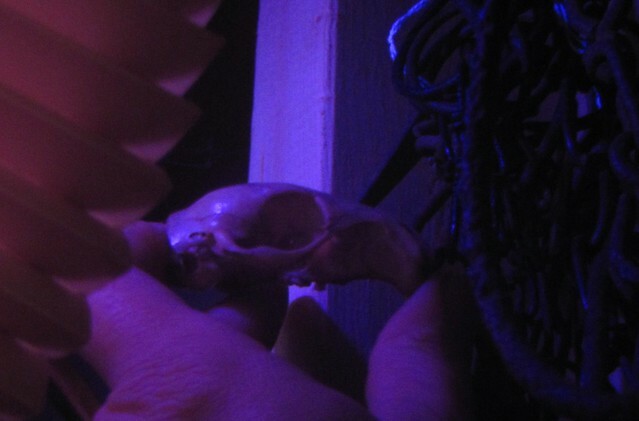 I was particularly fascinated by the glowing skull. Wrote that one down in my skull book, just in case I need to reference it again sometime. And that projectile point – very cool! I have an archaeology friend who would find it fascinating. This post is a great reason is why I keep reading this blog, now for several years. Ger. This was a particularly interesting piece! You really should build these blogs into a book! Kudos, bro! This piece is especially poignant… a time-machine experience. The world is such an incredible place, and to be able to observe it through time, a special gift. Thanks for sharing. And ditto on what bro Mick said! I always enjoy you blog entries. Great job!